Get Centers Ready for Back to School! July 19, 2018 July 18, 2018 Amanda B. Are you thinking about some new centers for back to school? Here are a few ideas to get the school year started! The beginning of the year is the perfect time to start your Memory Journals or Books. Students make one page a month, and at the end of the school year, you have a whole book to send home to families. You can see how I use this monthly writing activity in this blog post. We are going to be using these activities every week to reinforce the sight words we are working on. There are 3 different sight word activities that you can buy individually or as a set. These are perfect to use all year, students will know what to do after explaining it the first time. They are a fun way to work on sight words, and easy to prep for your literacy centers. We change our sensory bin every week, and we love to work on basic number sense skills at the beginning of the year so this is a perfect set! There are 10 different sets with different options for recording sheets too! Work on numbers, tallies or ten frames. 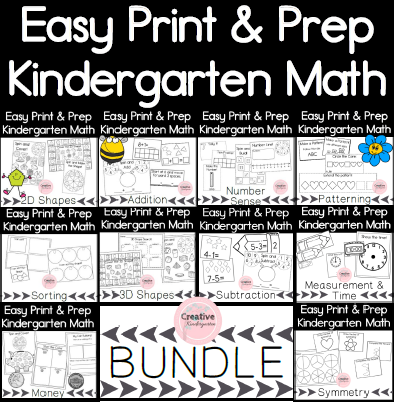 Each math strain is covered in these Easy Print and Prep activities. You can buy them individually, or you can buy them as a bundle and save! The centers that are included are fun for students, and will take you through the whole year! Need daily inspiration for your classroom? Make sure you are following me here, on Facebook and Instagram! Next postTake a Look Back #49- Piggy Bank Money Activity, Geo-Board Literacy, Roll and Stack Sight Word Center, and more!